If you’re interested in brand positioning, you may have come across the work of Warren Ellish, a renowned practitioner/speaker on brand positioning and a faculty member at Cornell University’s Johnson Graduate School of Management. Mr. Ellish will be presenting his thoughts on brand positioning at the IFA Convention February 13, 2012 (a week from today) at 10:15AM, and we thought it might be a good opportunity to ask him a few questions about brand positioning as well as his thoughts on the panel he’ll be presenting at #IFA2012. What are the most important things for start-up franchises, especially in the crowded food market, looking to position itself? The effective development of a clearly defined brand positioning for any new franchise brand is critical to the long-term success of that brand. Without a concise brand positioning statement with a competitive “point of difference” and complete management alignment behind that positioning, it will be difficult to communicate a clear and meaningful message about your brand. 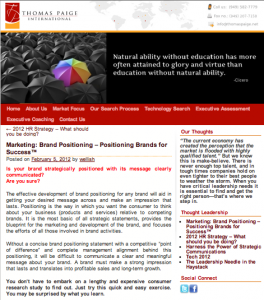 In other words this positioning will state the reason for the brand’s existence. A well-positioned brand has the power to change perception, influence preference and command loyalty. This will generate trial for the brand, increased frequency for the brand and in turn drive sales, market share and profits. The 3 critical elements of a brand positioning statement are “Frame of Reference”, “Market Target” and “Point of Difference”. When defining the brands “point of difference” it is important to make sure that the point of difference is preemptive, ownable and defendable. It is also very important to not let your brand’s point of difference be a point of similarity. Many franchise companies focus on important attributes of their brand but these attributes are merely nothing more than things their brand must do well just to be in the business they are in. They must be able to define and state what it is that truly sets their brand apart, what that reason is why a customer should or will choose to do business with them and choose their brand over the many alterative choices available. Domino’s has changed its entire public perception in recent years thanks in part to a savvy social media presence. Do you have any social media guidance for franchises? When it comes to social media, I always hear people say, “we can’t control what people are saying about our brand”. They feel like the Internet is like the Wild West with no sheriffs. Brands, and the management team of those brands, most definitely have the power to control what is being said about them. If you clearly position your brand, you will be able to help your targeted users to remember what it is you want them to remember about your brand – – and then they in turn will communicate that message to others for you. Additionally, I am a true believer that social media is an engagement medium. Brands have the opportunity to hear what their customers are saying about them in a real life situation and do something with that learning. Brands also have the opportunity to truly engage a current customer as well as future customers by making the social media tools part of the users life and making their life easier. This is way more than collecting ‘likes”, which I have not seen any data that truly correlates the number of likes your brand has to your sales, market share or profitability. Using your Domino’s example: Since Domino’s wants to be recognized at the world leader in Pizza Delivery, they have developed a mobile and web based application that builds on this and allows customers to order what they want when they want it. The application also engages the customer by allowing them to track their order from the time it is placed until it heads out for delivery. It even allows the customer to engage with the employees working on their order and provide feedback to those same employees on how well they did. What they have done is to allow their customers to know what is happening with their order – – something of importance to those customers. Is there a single thing that unites the marketing strategies of the country’s most successful franchises? Each successful franchise brand most likely has a marketing strategy that is unique to their specific business situation. These franchise brands will understand their frame of reference – – or what business they are in, who their target market is and have a clearly defined point of difference that is meaningful to that audience within that frame of reference. The leadership of these franchisees understand and care about what their brand is, what it stands for, what it offers, and why it is different. These franchisee brands make their reason for being exclusive and unique and using their brand a true experience. What can people at the IFA convention expect from your event? My 90-minute presentation to the IFA is titled “The Three Critical Steps to Positioning Your Franchise Brand Into a World-Class Brand.” The session is being held on Monday February 13th at 10:15AM at the Marriott World Center in Orlando. My session is meant to be both entertaining and educational and allows for participation from those that are attending. I want every attendee to leave my session with specific new tools to help them have an immediate positive impact on their franchise brands. The presentation is filled with stories and real life case situations to bring the brand positioning learning to life. The technique that I will share is the same one I have used to successfully position hundreds of global, domestic, regional and local businesses. I will provide a quick and easy exercise to allow each participant an opportunity to determine if his or her brand is strategically positioned and if its message is clearly being communicated? I will clarify what positioning is, why it is important, and how to determine the optimum positioning for franchise brands and even attendees own personal brand. Participants will learn how to craft brand positioning that will aid in getting their desired message across to the people they want to reach and make an impression that lasts. Everyone will discover how to allow their brand to reach its full potential in the marketplace, and bring additional focus to their organization’s initiatives. Attendees will even find out how to leverage their brands positioning to have a dramatic impact on raising funds for franchise growth. Is your brand strategically positioned with its message clearly communicated? Are you sure? Warren Ellish, President and CEO of Ellish Marketing Group is featured as a guest blogger inThomas Paige International’s Leadership Insights. Five great thought leadership blogs from industry experts are highlighted. Check out all of the blogs from Joleen Goronkin, Rick Van Warner, Rob Grimes, Tom Spry and Warren Ellish.